Plans to overhaul England's primary maths teaching would be "too much too soon" and could leave many pupils "by the wayside", a numeracy charity says. National Numeracy says Michael Gove's plans to make pupils learn times tables, long division and fractions earlier imposes a "superficial rigour". Pupils should instead be given time to gain a secure understanding of mathematical concepts, it adds. The government said it wanted to raise standards so pupils could progress. The draft primary curriculum for maths, due to be introduced in schools next year, contains plans for pupils to memorise their times tables up to 12 by age nine, multiply and divide fractions by age 11, as well as learn topics such as geometry, long division and multiplication and decimals. It also expects pupils be able to recall subtraction and addition sums to 20 by the age of seven. The current more flexible targets by the end of each Key Stage will also be replaced by more rigid year-by-year targets, but it is not yet clear how this learning will be assessed. National Numeracy says it welcomes the government's prioritisation of maths, but it warns that the curriculum proposals "contain serious flaws" which run counter to the government's stated aims. A letter from the charity's chief executive Mike Ellicock to the Education Secretary says: "We believe that the general direction of the programmes of study will make the achievement of these aims less rather than more likely." He says all pupils must be helped to build a secure basis of mathematical understanding early on. 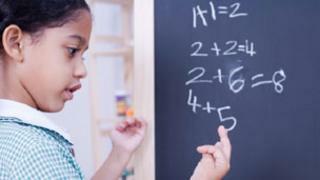 The basic concepts of addition and subtraction, place value, multiplication and division, and how they relate to each other, need to be understood before children can go any further in the subject, he says. He acknowledges that ministers will share the charity's concerns that too many adults are innumerate, but warns that the new approach will not provide a solution. "It appears to us to impose a rushed, superficial 'rigour' by introducing too much, too soon, with the danger that many children fall by the wayside and lose interest. "Mathematics teaching already regularly fails learners by trying to impose abstract methods without first laying the necessary foundations." He adds that there is a risk that both teachers and pupils return to instrumental methods and follow rote learning procedures prematurely. "We believe that early dependence on instrumental and rote processes contradicts the best evidence, creates failures and will undermine attempts to raise standards of numeracy in primary school." But Prof David Burghes, a mathematics experts with think-tank Politeia, welcomed the government's plan to overhaul mathematics with its emphasis on high levels of competence in basic skills which, he said, reflected the curriculum in some of the high mathematically performing countries. "Indeed in our view such competence is central to the success of primary mathematics, so much so that we would recommend an earlier emphasis for the mastery of some basic skills such as multiplication tables," he said in a paper due to be published later this week. He added that he wanted to see a greater emphasis on logical and mathematical thinking, and that he would like to see algebraic concepts and the beginnings of probability introduced and developed throughout the primary school. The Department for Education said: "Pupils leaving primary school aged 11 currently only learn up to their 10-times tables. But the new curriculum will make sure that by the age eight or nine, pupils will know tables up to 12. This is not too much too soon and will match places like Massachusetts which do the best in international tests. "What is most important is raising standards and making sure all pupils get a good grip of the basic concepts. That will mean children are better placed to make progress at secondary school and start to study areas like algebra."